Safety alerts are published by Transport Safety Victoria (TSV) under section 197 of the Transport Integration Act 2010 (Vic) to promote the safe operation of transport services. Safety alerts are intended to provide information only and must be read in conjunction with obligations under relevant legislation. Maritime Safety Victoria (MSV), a branch of Transport Safety Victoria, has identified a design fault in a batch of a Jarvis Walker branded block-style lifejacket. This is a common lifejacket type, often provided free-of-charge to boat purchasers within sales deals. MSV is working diligently with the supplier to have the faulty batch removed from retail outlets, and to alert the public to avoid purchasing/relying on the identified lifejacket. MSV undertook its own testing of the Jarvis Walker block-style lifejacket model Type1 PFD of batch number WD-15-0588 (Date of manufacture: October 2015). The lifejacket was constructed with a suspected design fault of having the waistband affixed to one side only. In testing, it was found that the unsecured side of the lifejacket slipped free of the waistband when test subjects entered the water. 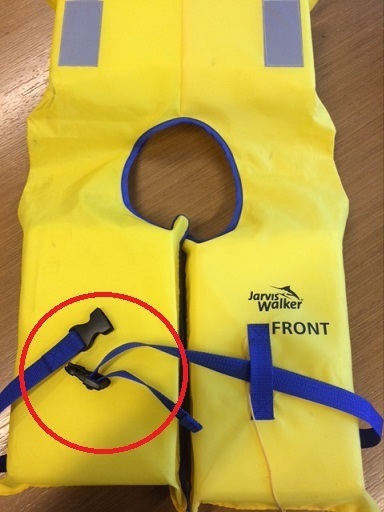 Subsequent loss of integrity in the lifejacket meant the wearer’s head would likely not be held securely out of the water, posing a serious risk of drowning in the event of a marine incident. The results of the testing found the lifejacket did not conform with the ‘Ability to withstand impact’ and ‘In-water performance’ sections of Australian Standard AS-1512. A Jarvis Walker lifejacket with waistband only affixed on one side. Model: Type 1 PFD, Batch: WD-15-0588 (October 2015). A subsequent batch of the same model Jarvis Walker lifejacket with a loop on each side of the jacket to better secure the waistband and both foam blocks. Model: Adult PFD 1, Batch: Multiple batches. Watch the Australian Competition and Consumer Commission ACCC website for any product recall advice. 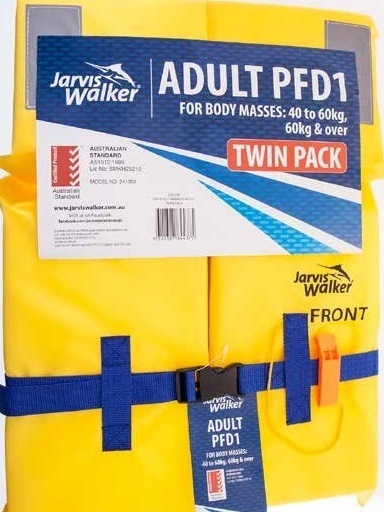 Check their own Jarvis Walker and other branded block-style lifejackets for a similar design fault, return it to their supplier, and replace it with a design including a waistband secured on each side, either by stitching or through secured loops on each side. Check that other branded lifejackets of any style have a waistband that is securely affixed on both sides (for children’s lifejackets, a crotch strap is recommended for extra security). Be aware that lifejackets bought online from international suppliers may not meet Australian Standards. Ensure lifejackets are stored so that they are visible and therefore accessible by all passengers during an emergency. Review lifejacket safety information, visit wearalifejacket.vic.gov.au or contact MSV at info@transportsafety.vic.gov.au or 1800 223 022. Check Jarvis Walker and other branded stock for a similar design fault and contact your supplier. Review their lifejacket products and designs for a similar fault which may compromise foam block integrity on impact or while in the water.